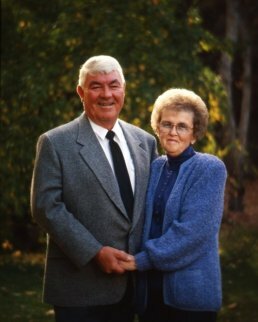 Harvey L Jones Farms Inc...Harvey and Mildred Jones began farming in Zillah, Washington in 1946. They began with 320 acres of sagebrush which is now the orchards and fields that supply the produce for Jones Farms. In 1974 Harvey’s sons partnered in on the farm. Each brother partnered in with 100 acres. Eventually both brothers bought into the corporation of Harvey L Jones Farms Inc.
Dennis and Linda then began concentrating on produce, specifically tomatoes, which used to be sold as a “u pick”. Tomatoes and sweet corn were the beginnings of the produce business. Eventually peaches and nectarines became part of the produce business and nearing the mid 80’s the family entered into the fruit stand business. In 1991 Jones Farms Fruit and Produce was built. The produce business started with a fourth of an acre and now takes half the farm to supply this growing business. Over 200 acres is marketed through whole sale or the fruit stands. Today you can visit Jones Farms Fruit and Produce at the Zillah location or the Yakima location at 410 S. 51st Ave, Yakima. Just North of Tieton, near Glenwood Square. Jones Farms today is run by Dennis who is President and Treasurer and Will Jones who is Vice President and Secretary.